In among all the fairly poor deals in the Debenhams sale this one stands out a bit at half price. Can't see it anywhere else close to this price except for on Amazon which is sold by Debenhams anyway. Cheapest sold price on Ebay is almost £60. Even better if you've been sent a 15% off cardholder code as we have. Also 3% TCB possible. Great price! Gutted I missed the Thomas deal from Amazon a month or so …Great price! Gutted I missed the Thomas deal from Amazon a month or so ago... but this is tempting. Long live Hornby Heat OP. Nice little trains, and bought the Santa express, £50 at the moment from Argos a couple of years ago. 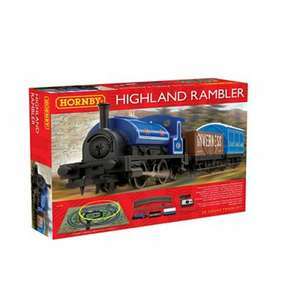 Hornby, a great Chinese company.